Choose our Aqua Massage XL 250 Profiler Model. This is the workhouse of the Aqua Massage product line. with a stainless steel canopy, 36 waterjets and pump. It is primed to provide years of relaxation and revenue making. 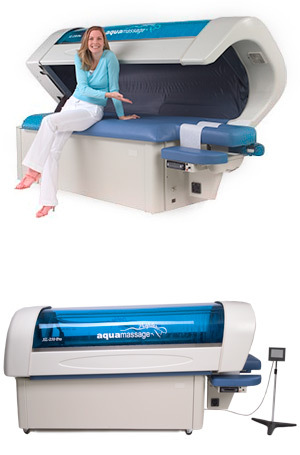 The Aqua Massage XL 250 Profiler Model is perfect for: Wellness Centers, Retail Locations, Commercial Application etc. New contemporary style with stainless steel canopy. Stainless steel water jets and pump. Variable speed fan and Aromatherapy. Adjustable cushion system and pre-wired GFI assembly (Domestic Only). AVA Relaxation System - which features an Audio-CD/MP3 player system with headphones.